Early electric forklift usually uses lead-acid batteries, but the lead-acid batteries lead to the environmental pollution because of its large volume and low energy ratio. The new lithium batteries, with high energy ratio, and the same power / small capacity, small size, light weight, as well as long cycle life, now began to substitute for lead-acid batteries. Based on industrial characteristics and customer needs, we choose lithium iron phosphate battery to support the product of electric forklift truck. Thus, battery can do the continuous work in a high current condition, and the protection board adopts imported IC and MOS tube as a control management，working life is 3-5 times of lead-acid batteries. Battery design is aimed to support the usage of logistics forklifts, requiring small size, long working hours, can drive two motors: one is drive the car running, the other one is drive lift objects. The total power of electric forklift lithium-iron phosphate battery design is 800W, and instantaneous power is 1000W. This kinds of battery have moisture proof appearance, long cycle life, high power, high current discharge performance; entire product adapt indoor environment with low temperature. A.Protection Board (PCM): According to the chemical properties of lithium-iron phosphate battery and working properties of forklifts, targeted to design the protection circuit, in addition to overcharge, over discharge, over current, short circuit protection and other functions, the protection board design also have to provide full consideration to the issue of cooling power and battery balancing, the whole protection plate have to use made of aluminum alloy as heating panel, the temperature need to below 20 degrees. B.Protection circuit: Use imported IC and MOS tube, and constantly monitor the situation of overcharge, over discharge, over current, short circuit occurring, so that the chip can operate in a safe, stable and efficient condition. C.Overcurrent fuse: mainly to protect the failure of lithium battery management system. The battery pack usually use high power battery cells with large capacity, although the battery management system have overcurrent and short circuit protection, if there happens an exception it will also lead to failure of protection, and output short circuit will produce very large current. Thus we have to add overcurrent fuse, when an exception occurs, the fuse will disconnect circuit，and unrecoverable, to achieve the purpose of abnormal protection. D.Battery cells: Use the LARGE26650/3.2V/3000mAh lithium iron phosphate battery cells, maximum charge rate of the battery can be reached to 1C, the maximum discharge rate can be reached to 2C, the battery cells have multiple security features. The thermistor has built into battery cells, modular constructions also use PTC isolation; prevent the occurrence of electrical surge. E.Battery parameters: 25.6V/80Ah (General nominal: 24V80Ah). Normal operating current 30A, the maximum operating current can up to 50A, instantaneous starting current can reach to 120A. 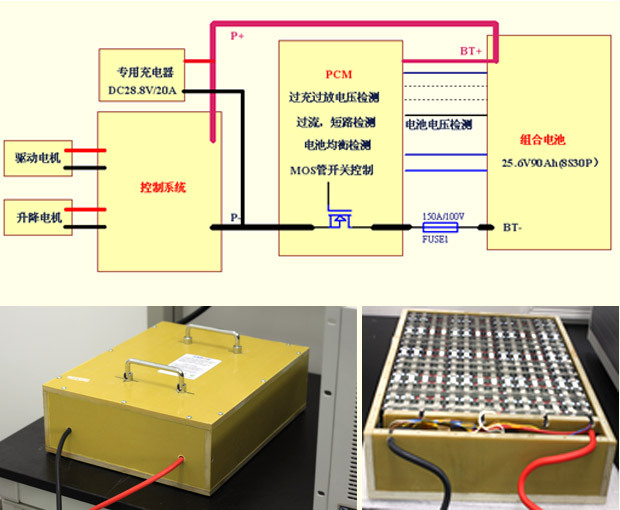 F.The built-in Resistive balanced protection board car battery pack can effectively compensate for reducing capacity caused by the differences of batteries monomer，and maximizing battery life. G.Batteries in parallel unit: PTC isolation avoids the inrush current security issues caused by high capacity. H.Large current of the main circuit of the battery uses copper as collector bar, and try to make single battery discharge current close. I.The method that battery pack uses plastic brackets to isolate and fix batteries is more conducive to safe use and battery cooling.